There are any number of reasons this error can occur, some of them pretty bad (feel free to google them). The first thing to do is make sure your lens is snugly attached to your camera. 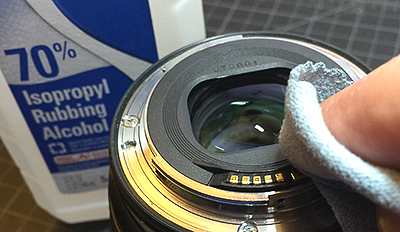 Remove and replace the lens and be sure it locks on solidly. Sometimes thats all it is, when putting on or changing lenses, the lens didn’t seat right. If the error still persists, though, the suggestion of cleaning the contacts is at least a good first step. If you look at the picture on top, that’s my camera, and the contacts on the lens do appear a bit dirty. Ok, so we’re clear on that, right? Good. Erasers might be good for old-style electronics contacts that are heavier and have lots of tin solder or copper to make the electrical contact. 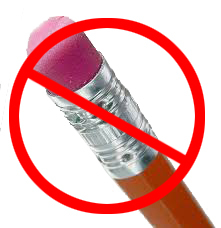 Erasing those is fine, as the eraser is abrasive and actually removes potentially oxidized material to reestablish good electrical conductivity. You camera’s contacts, on the other hand, are thinly gold-plated. Using an eraser will actually remove the gold from the contacts making them less conductive and even potentially damaging them. The gold is not getting oxidized, it’s probably just a bit dirty from humidity, your fingers or whatever. Plus, an eraser leaves eraser bits, and really, you want to risk an eraser bit in your lens or camera? 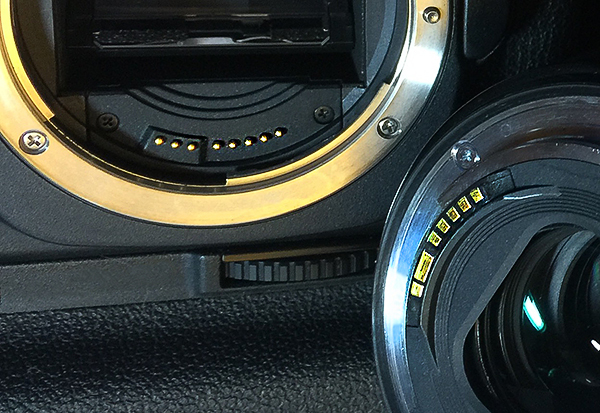 With the lens and camera body apart, look at the area around the contacts of the lens and or camera body. Gently brush away from the openings any dust or debris you find there. Put a bit of alcohol on a microfiber cloth. Dry with a dry spot on the microfiber cloth. Reassemble and check for operation. 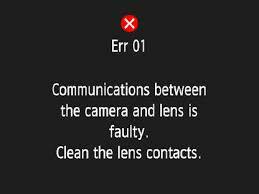 In my case, cleaning the contacts seems to have cleared up the error. If it persisted, I would likely be looking at an expensive lens or camera repair. Pfew! Safe for this time.